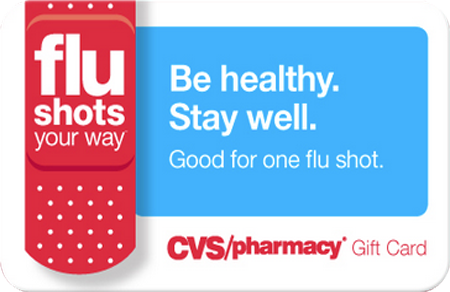 Keep your workforce healthy with a CVS Pharmacy® Flu Shot eGift Card*. CVS Pharmacy Flu Shot eGift Cards are a perfect incentive for workplace wellness programs to ensure that your employees remain healthy all year long. Why choose CVS Pharmacy Flu Shot eGift cards? The CVS Pharmacy Flu Shot eGift card is only available in electronic format. Q. Is there a minimum eGift card order? Yes, the minimum order for the CVS Pharmacy Flu Shot eGift card is $500 at face value. Thereafter, you can place eGift card orders as needed. Q. Are there discounts available for bulk eGift card purchases? Yes, we offer several discount levels for eGift card purchases based on annual volume. Q. What eGift card denominations can I get? Q. Can I order mixed denominations on my eGift card order? No, CVS Pharmacy Flu Shot eGift cards are only available in one denomination. Q. How do I pay for my eGift card orders? All eGift card orders require payment with order. You can pay by company check or ACH. Q. How and when are the eGift cards shipped? eGift cards will be sent via email in a password protected Excel file. eGift cards are delivered as a hyperlink and password that you can provide to the recipient via email. Q. Are eGift cards shipped activated? Yes, the eGift cards are activated once they are generated. Payment needs to be received prior to delivery. Q. How do I activate my eGift cards? The eGift cards are delivered activated. Q. Does the value of the eGift card appear on the face of the certificate? The original purchase value does appear on the top of your eGift card. Q. Is there an expiration date on the eGift cards? No, the eGift cards have no expiration dates. Q. Are there any fees if the eGift cards are not used? No, the eGift cards have no dormancy fees or other fees. Q. Can the eGift cards be redeemed for cash? No, the eGift cards cannot be redeemed for cash and can only be redeemed at a CVS Pharmacy. Q. Where can the eGift cards be redeemed? eGift cards can be redeemed at any of the 7,800 CVS Pharmacy store locations in the United States as well as any Long’s Drug Store. To see a complete list of CVS Pharmacy locations, click here. Q. Are there restrictions on what can be purchased with the eGift cards? Yes, the CVS Pharmacy Flu Shot eGift card is only allowed to be used to obtain a flu shot. CVS Pharmacy Flu Shot eGift cards cannot be used to purchase prepaid cards or any money order product. Q. Are lost eGift cards replaced? No, the eGift cards are treated as cash. We are not responsible for lost or stolen eGift cards. If you have any additional questions contact us today or call 1(800)413-9101.